Like many of the entrepreneurial ilk, Andrew Huff had a hobby in which he saw room for improvement. So he started building long boards—at age 16. There’s nothing too out-of-the-box about a skateboarder, long-boarder, wakeboarder and snowboarder kind of teen—it’s a bit of a package deal. But there is something unique when you add to those loves a fascination with reclaimed wood. “I was really into the whole wood scene—I find a lot of beauty in wood,” said now 21-year-old Andrew. Encouraged by a little knowledge from a building trades class at Bremen High School, he saw a way for both aspects to come together. His first big purchase was his band saw, a basic necessity for building a quality board. Then, piece-by-piece, he added a planer, more saws, sander and presses – all of which he purchased new and used and fashioned to fit is own needs. “Huff & Puff makes cruiser boards for all ages,” said Matt Lucas, assistant manager at Outpost Sports in Mishawaka. “Andrew’s boards feel really good and they are a comparable cruiser to some of the bigger companies like Sector 9 and Arbor.” With the buzz that they are made from reclaimed wood, have local theme, and that Andrew does custom set ups and graphics, Huff & Puff longboards is having a good ride at Outpost. 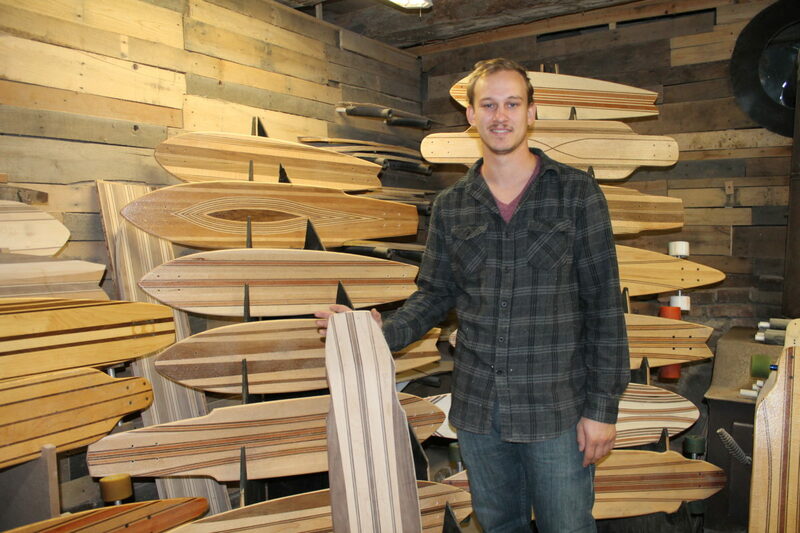 Andrew works his marketing efforts with online, direct sales to customers and with social media (Facebook, Instagram and his website,) key to selling the virtues of handcrafted boards to his target college and teen markets. colors are different types of hardwood, making each board. An average board might have 30 layers of wood on top, be five layers deep, and have another 20 layers on the bottom—making each unquestionably unique. The boards run from an industry-competitive $179 to $349.